WALTHAM - It was a severe head injury, finally, that did it. 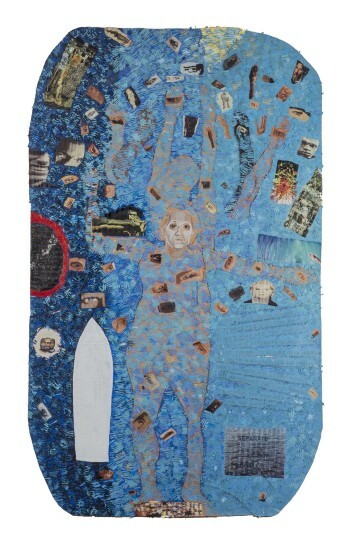 By 1979, Howardena Pindell had carved out her own corner of the New York art world - no small feat, being a young black woman in a field all but owned by older white men, many by then basking in their own canonization. Then it happened: a car off the road, the injury, and, after a time languishing with short-term amnesia, a rough awakening. Pindell had treaded too lightly for too long, she decided, with her brilliant but restrained, finely made works. Her fractures were not just of her head, but of her soul, and the light now blazing through them told her what she had to do. "What Remains to Be Seen," Pindell's 50-year career survey now at the Rose Art Museum at Brandeis University, cleaves her career neatly in two: before and after, injury and not. The two halves stare at each other across an architectural divide: The Rose's clean Modernist box of a gallery, built in 1961, is filled with Pindell's earlier paintings and drawings, most of them abstract, nearly all of them brimming with a restrained joy and careful precision. Its new annex, built in 2001, contains a gush of Pindell's boiling rage, intense swirls of image and text exploding with political complaint. Just eight months after the accident, her mind still swimming in the fog of memory loss, she made "Free, White and 21," a video piece in which she stares down the camera, bluntly recounting her struggles with racism and sexism in the art world. Then, lacquered in white face, Pindell chides her various complaints as trivial or imagined ("You must be really paranoid," her white alter ego says. "I've never had an experience like that, but of course I'm free, white and 21.") Clearly, there would be no going back.